In the October 2012 issue of Utility Products magazine SSOE’s Ed McConnell, PE, discusses how communication, training, and culture changes within an organization can be the solution to minimizing arc flash injuries. Every year some 2,000 workers are admitted to burn center because of arc flash injuries. Fortunately, injuries of qualified personnel are declining. 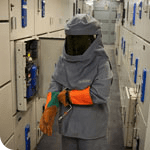 To ensure the decline continues, click below and read this article for methods to raise awareness on the importance of arc flash safety.